In my part of the world, many of us are homebound today due to the weather so no better time than to think about Happiness! Just listening to the song improves one's mood! 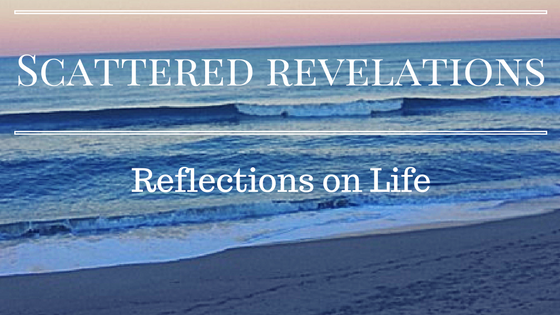 This is a sermon I preached this past Sunday, March 2, 2014 at the Unitarian Universalist Congregation of the Outer Banks. The text and inspiration for the sermon is the song "Happy" by Pharrell Williams. Many people if you ask them what they want, they want to be happy. We spend a great deal of our lives trying to figure out what will make us happy. We hope for a job that will make us happy … house, money, friends, activities. We often define happiness as something that comes from the outside in. Happiness can also get a bad rap – that somehow maybe it is shallow to want to be happy or to pursue happiness. We talk about wanting meaning or joy or somehow something deeper than mere happiness. In fact just yesterday there was an article that weighed happiness versus meaningfulness. This song, which is one of my current favorites, had me thinking differently about happiness. He talks about happiness as the truth. Happiness is the truth. What might that mean? Is there something we are missing when it comes to happiness? Marketers and the consumer culture want us to believe that happiness is found when we buy their products. We are sold by advertisers that happiness is external to us and that things are what we need to be happy. Of course, they also must convince us that we are not happy – so we have news that is filled with stories that incite fear, keep us in our homes, tell us all that is wrong with the world and with us. We have a 24-hour news cycle that keeps us constantly on edge, waiting for the next tragedy, war, economic disaster. They tell us we need to look outside ourselves. That once we have this, or have achieved that, we will be happy. We often internalize these messages. Convincing ourselves that we will be happy once we lose that last 10 pounds. We will be happy when we find the perfect partner and then we won’t be lonely and we will always be happy. Or worse, if I just have a baby I will be happy, my children will make me happy. How many marriages end when happiness is not guaranteed and that if we look for someone else to “complete” us or make us happy it is nearly destined to fail. Or how many children are bearing the weight of their parent’s happiness? That parents are fulfilling their unmet dreams of happiness or trying to assure happiness in their children by chasing great grades, every extracurricular opportunity and all other types of “enrichment.” Yet none of these things bring true happiness. There may be momentary happiness but then it fades and we are left wondering again what will make us happy and what might be wrong with us that we can’t seem to get there. Yet, some people just seem to be happy. Two public figures that come to mind are the Dalai Lama and Desmund Tutu. It seems to exude from them. If you have ever heard the Dalai Lama speak, his laugh is infectious – it is amazing. Desmund Tutu’s smile lights up his whole face. 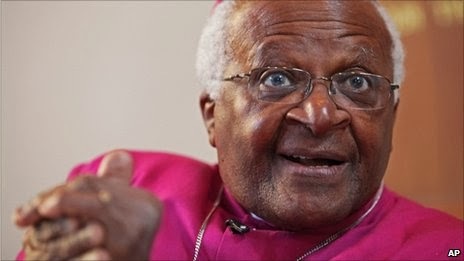 This photo came from the profile of Demond Tutu on BBC News. Both of these me n have suffered, both have seen first-hand the horrors that humanity can inflict on the earth and each other, yet they approach the world with happiness. There is something very appealing about being around happy people. Their happiness is contagious. The eight practices can help us find out what happiness is to each one of us. It also seems to mean that our faith communities could play a big role in helping us cultivate happiness. What if our communities saw their role as cultivating happiness? Well let’s look to the practices. Exercise and diet make sense because happiness is embodied. One of the reasons this song is so infectious is that at least for me, I can’t help but want to move and dance even if it is just car dancing! If our bodies are not feeling well, if we are in pain or sick, happiness can be more challenging. I started working out again just before the New Year. I started primarily because I knew that it would boost my mood. The endorphins released when I work out help me feel more awake and feel better all day long. It works. I am much more grounded, more able to deal with stress and challenging situations. So it also helps with the practice of stress management and relaxation. Another one of the practices is time in nature. Our seventh principle affirms our part of the web of existence. Taking care of the earth and concern for the earth is one of our most highly held values. If we as UU’s encouraged people to spend time in nature, made it a practice then that would also help people cultivate happiness. I know for myself, living here in the midst of so much natural beauty just makes me feel good. When I look out at over the water there is a sense of peace, a sense that all will be well. It is hard not to be happy, walking along the beach on a beautiful February day with your family, picking up sea shells, watching the sea gulls and the waves go in and out. Unitarian Universalists have long cultivated service and justice work as key values and practices. Even when there is not much else we may agree on, we agree that promoting justice, dignity, healing the world is one of our primary values as a faith community. Our care of the earth is a justice seeking activity. If happiness is cultivated through service, through contributing to the greater good, then our faith communities can be places that people find meaning and purpose. How many of those who have pursued money as a means to happiness, have lost a sense of meaning and purpose. They may have all the toys and they sit wondering what it all means. Maybe it is not meaningfulness versus happiness but that in cultivating meaning and meaningfulness through service, through contributing, that leads to happiness. That when we find within ourselves a sense of purpose, when we are serving and contributing we also find what makes us happy. Both Desmond Tutu and the Dalai Lama exemplify lives filled with meaning, purpose, and service. Faith communities at their best foster our sense of connectedness our being part of a whole. As Unitarian Universalists we affirm both the value of the individual and the connection with each other and existence. These are our first and seventh principles. Taking the time to care about one another and getting to know each other is a key reason people seek out faith community and if we do our job well, why they stay. We as Unitarian Universalists need to remember to cultivate both our first and seventh principles. Sometimes we focus so much on the first that we forget to pay attention to the last – that we need each other, that we are connected. Often the mega churches and more evangelical churches have often mastered the skill of cultivating relationships. They have systems to connect people, to get them involved, to help become a part of the community. People will often stay in those communities, even if they don’t share the beliefs or disagree with the doctrines, because the community is so central to their lives. Often people in these communities have a sense of being connected to their larger bodies, to those that are also members of their faith community across the globe. It is this sense of community that keeps them coming back. At our best, we too can nurture each other, welcome each other into wanting to come back. When we practice radical hospitality, really welcoming the new person and checking in on each other, then we are building community. When we help each other cultivate a free and responsible search for meaning. When we practice justice and peace-making, when we engage in the democratic process together then we bring together our first and seventh principles. Being part of community is one of the practices for happiness. As we cultivate relationships with one another, we cultivate our own happiness and that of others. One of the things that strikes me in the video for this song are the people, the diversity of the people, people dancing together, people dancing alone, in a wide variety of spaces – nature, buildings, a church. There is interaction with others and the environment. Williams tells us bring on the bad news because nothing can bring him down. It doesn't mean he doesn't care. It means he doesn't let the external events determine how he is going to respond. It is back to the idea of re-framing. Like the farmer in our story, it may be too soon to tell! Sometimes things that we think are wonderful in the moment turn out not to be. Other situations may at first look insurmountable, and in time they become a gift. In any given situation we have the choice of how we will respond and how we interpret the events. Sometimes it may be best to adopt the attitude of the farmer “It could be good. It could be bad. It is too soon to tell.” We can choose to interpret the events of our lives even when those events are filled with sorrow, filled with pain, we can choose to not let them define the entirety of our lives. We can move through the pain. Even in the saddest moments, when we lose someone we love, moments of joy can break through. At our best as a faith community, when people are facing the hardest, most challenging moments of their lives – illness, death, loss – people are there. They listen, they bring meals, they ask you how you are and yes they really want to hear the answer. We hold each other in our thoughts and prayers. The eighth practice is that of religion and spirituality. Our call as people of faith is to cultivate happiness. When we fight injustice, when we work for healing, when we create opportunities for connection and service, for relationships then all those things cultivate happiness. There are many ways this is said – throughout the Hebrew and Christian Scriptures there is a call for life and living in abundance. The Dalai Lama states that the purpose of our lives is to be happy. He also writes “If you want others to be happy, practice compassion. If you want to be happy, practice compassion.” Ralph Waldo Emerson tells us “To get up each morning with the resolve to be happy…is to set our own conditions to the events of each day. To do this is to condition circumstances instead of being conditioned by them.” Helen Keller, another who was no stranger to adversity, says “Resolve to keep happy and your joy and you shall form an invincible host against difficulties.” Many voices, from many traditions remind us that joy does not come from outside of ourselves but really from within; that we find it most in spreading to others, in relationship, in service. Happiness then is not as elusive as we often think but rather we can cultivate it, we can choose it, we can embody it. We don’t have to wait until we lose 10 pounds, find the perfect job, the perfect partner, we can choose to be happy right now, just as we are. So yes Happiness is a truth. I don’t know that it is THE truth but it is true. We can truly be happy! We can cultivate the practices that lead to more happiness. Here at UUCOB we can help ourselves and others to learn what makes each of us happy. We can celebrate and be happy together along with sharing pain and grief. Our community is big enough to hold them both. UUCOB and all our faith communities can be places that cultivate happiness. Now there is a good bill board sign – come and cultivate happiness!